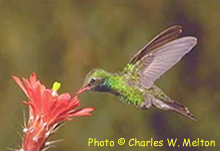 Of about 330 known species of hummingbirds in the Americas, 68 are on the IUCN Red List. At least two of these are extinct and the rest are declining. Many are in trouble because of the degradation and loss of their natural habitats throughout the Americas. This is especially crucial when considering migrant hummingbirds, which rely heavily on high quality stopover habitats. In this case, urban areas may prove a valuable surrogate for degraded stopover habitats. Reconciliation ecology is a sustainable strategy to conserve native diversity by enabling the coexistence of humans and wildlife in human dominated areas. Conserving wildlife in our surrounding contributes not only to conservation, but also to our well being, quality of life and education. Neotropical hummingbirds migrate through Arizona during spring and fall. Other species are permanent residents of the area. This project aims at monitoring and increasing hummingbird diversity in Tucson, Arizona. Competition may alter the number of species in a habitat. Following ecological theory and experiments, we expect the variation in food availability in the form of hummingbird plants and feeders to affect the number of species in a given area. Here, we are applying our knowledge of species interactions among hummingbirds to increase their diversity. This will be a model system for the reconciliation of hummingbirds in cities. It will serve to inform and contribute to conservation efforts even beyond the confines of the city and this project. Hummingbird diets consist of nectar and insects. Using feeders, people can easily manipulate artificial resources and study hummingbirds in natural habitats. Aggressive interactions and competition are common among hummingbirds. Usually body size correlates with interspecific dominance. In some species, this affects feeder selection. In this project, we will study the effect of various food enrichment levels and vegetation on abundance and behavior. Beyond conservation, results of this study will also suggest how hummingbird communities are actually organized. About 11-15 hummingbird species breed in or migrate through Arizona. Only few of these species are common in Tucson (mostly Anna's and Black-chinned hummingbirds and to a lesser extent Costa's hummingbird). A few more species are occasionally seen. Habitat and climatic conditions help determine hummingbird abundance and distribution. But species interactions and community ecology also matter. Hummingbirds sometimes change habitats or feeding preferences because of competition from other species. They may or may not be territorial depending on their food supply. Comparison of yards with different plants and various numbers of feeders will enable us to establish the competitive relationships among the hummingbirds. We shall collect data about feeding, perching, singing, scout flight and /or insect feeding, display flight and chasing. These data will let us infer territoriality, social ranking and community organization among the various species. In short, we will try to understand how community ecology is affecting hummingbird distribution in and around Tucson, AZ. Studying the ecology of a species in an urban setting has several advantages. It enhances our understanding of biodiversity and ecology in human inhabited landscapes, which is meaningful for pure science, as well as conserving the species through reconciliation practices. Scientifically supported action, and quality data collected by citizen-scientists who care, are the core of this project. We thank all our volunteers for their efforts!